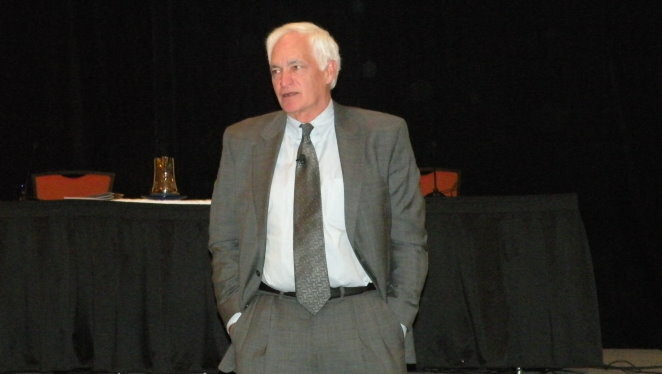 Oklahoma Farm Report - Dr. Lowell Catlett Says "People Afford What They Want"
Dr. Lowell Catlett Says "People Afford What They Want"
Our first story that kicks off our coverage from the International Livestock Congress in Denver features the leadoff speaker for the day long session. Dr. Lowell Catlett of New Mexico State University pointed out to the audience the differences of the World War II generation that is quickly dying out versus the Boomer Generation that is now starting to hit retirement age. In the case of Beef- Dr. Catlett says the older generation considers beef a basic food- a source of protein and calories. In contrast, today's consumers want a lot of different things from their beef experience- a few still want just a basic food. But others want a "prime" steak product- while others want an organic beef product produced with no antibiotics or hormones provided by humans to the critters. Still others are looking for a beef "experience" at a high dollar beef restaurant- or a fun and loud establishment. Dr. Catlett says that all of the needs of the consumer- it gives us more chances to sell our product at a premium, because he believes that "People afford what they want." We talk with Dr. Catlett about this brave new world that we find ourselves in- and how it has changed our beef market here in this country and globally, how it has impacted the availability of ranch land and a lot more. Click on the Listen Bar below to listen to our conversation with Dr. Catlett.